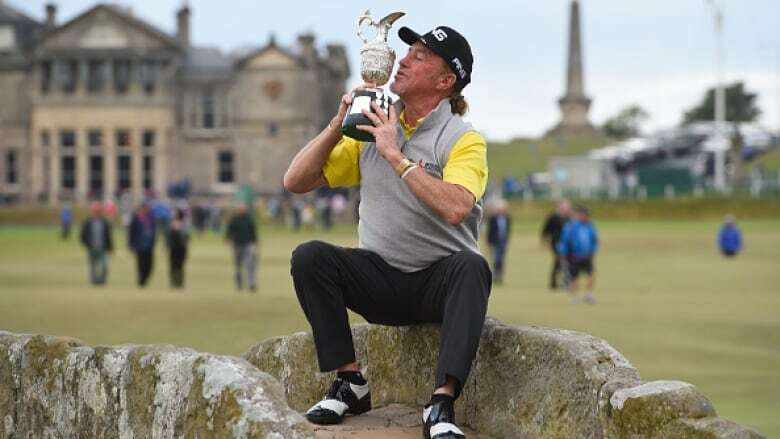 Miguel Angel Jimenez won the Senior British Open on Sunday, edging defending champion Bernhard Langer by one shot. Canada's Stephen Ames finished tied for third. Miguel Angel Jimenez became the first Spaniard to win the Senior British Open on Sunday, edging defending champion Bernhard Langer by one shot. Jimenez dropped only one stroke en route to a final round 3-under 69 and ended on 12-under 276 at the historic Old Course. Jimenez was following in famous footsteps as the second Spaniard to win at St. Andrews after Seve Ballesteros won the British Open in 1984. "This is the place where everyone wants to win and the place where Seve won his second British Open," Jimenez said. "It has always been my ambition to win here. It feels like I am part of history." The 54-year-old Jimenez played the sort of round every professional golfer dreams of on the final day at St. Andrews, and often in unpleasant — occasionally vicious — weather conditions. Langer shot a 68 to come second. Americans Kirk Triplett (69) and Scott McCarron (68) tied for third alongside Canada's Stephen Ames (69). All three finished on 10 under. Jimenez won the Regions Tradition in May, holding off a hard-charging Steve Stricker for his first senior major title. On Sunday, in the immediate aftermath of his second major title of the year, the self-styled "most interesting man in golf" played down his celebrations but the prolonged raising of his arms was evidence enough of his delight. And relief. Only by making a vital nine-foot putt for par on the penultimate green had Jimenez held onto his overnight lead. "I didn't play too good over the last few holes," said Jimenez. "I didn't hit many solid shots. And I missed short putts on both the 14th and 15th. At that stage I was feeling the stress. My heart was really pumping very fast." In search of a fourth victory in this event, Langer had cause to regret a couple of lapses, most notably the three-putts he needed to complete the par-4 13th hole. It was his only bogey of the day, but it was enough to give Jimenez a three-shot edge that proved just too much to overcome. "Miguel played an awesome four days of golf, and he's a very well-deserved winner," said Langer, who closed with a 4-under 68. "I was pretty happy overall. It wasn't easy in some of the conditions that we had." The leaders made their share of mistakes down the stretch into a diminishing wind but their problems were nothing compared with earlier in the day. At its height, the wind and rain transformed the back-nine into a succession of par-5s. Despite the late improvement in the conditions, the 72-man field was a collective 136-over par. Former Australian Open champion Peter Fowler - not exactly the shortest hitter in the field - was short of the 465-yard 13th after a good drive and full-blooded 3-wood. Even worse, two holes later he was unable to reach the fairway on the 455-yard 15th with his best drive. Around three hours later, Jimenez comfortably found both greens with mid-irons. There was ultimate disappointment for Tom Watson. Playing what could be his final competitive round at St. Andrews, the 68-year old American — five times a British Open champion and three-times a winner of this event — had a closing 77 that left him in a lowly tie for 21st place at 1 under. Watson was still afforded a rousing send-off. "As ever, the fans were really very good to me," Watson said. "I gave it right back to them. I appreciate what they do for me. This is a unique setting in golf, probably the most unique. You come into the town on the last hole and finish amongst all the buildings with the people hanging over the rail up there. There's no other place like it."